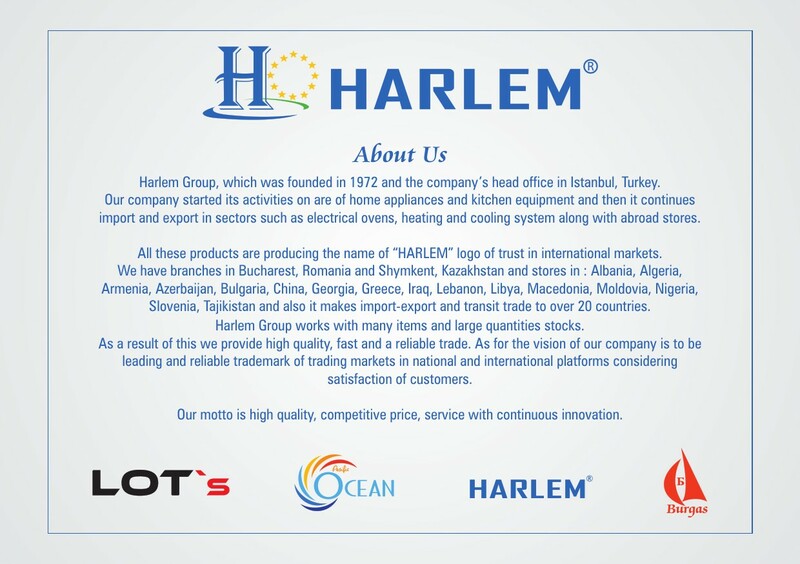 Harlem Group, which was founded in 1972 and the company’s head office in Istanbul, Turkey. and export in sectors such as electrical ovens, heating and cooling system along with abroad stores. All these products are producing the name of ’’HARLEM’’ logo of trust in international markets. We have branches in Bucharest, Romania and Shymkent, Kazakhstan and stores in : Albania, Algeria, Armenia, Azerbaijan, Bulgaria, China, Georgia, Greece, Iraq, Lebanon, Libya, Macedonia, Moldovia, Nigeria, Slovenia, Tajikistan and also it makes import-export and transit trade to over 20 countries. Harlem Group Works with many items and large quantities stocks. As a result of this we provide high quality, fast and a reliable trade. in national and international platforms considering satisfaction of customers. Our motto is high quality, competitive price, service with continuous innovation.